Terracotta is a type of ceramic made from special red and brown clays. This material is shaped into the desired tile design and then is allowed to dry. After that, it is fired, either in a kiln or in a combustible pit. Firing the clay makes it hard, and durable, allowing it to serve as flooring. It can then be glazed to make it impervious to stains, sealed to protect it from damage, or left untreated in its natural state. In their natural state, terracotta tiles are a lovely mix of red and earthen hues, which wash in swooping clouds of color creating unique yet subdued images across the surface of every tile fired. This is due largely to the iron deposits contained within the clay used in their manufacture. It is this rustic beauty that makes terracotta so desirable as a flooring option. The problem is that terracotta is very porous in its natural state. That means that water and liquids can seep easily down into its core, causing mold or rot or stains to appear permanently on it. For this reason, natural terracotta is usually treated with a sealant periodically, to protect it against those hazards. Surface burnishing during the manufacturing process can also cut down on the absorbency to some extent. The reason that most people purchase terracotta flooring for the beauty and colors of the red and earthen hues. When a glaze is poured over them, this is hidden beneath a glass layer, that makes them impervious to stains, but also removes their rustic elegance. This is obviously a catch 22 of form versus function. In some cases, handmade or hand painted glazed terracotta flooring can achieve some balance of these two characteristics. In that case, the handmade nature of the tile shows through in the shape, while the glaze provides a cover to keep it safe. These tiles are produced in a factory based process that fires, cuts, and offloads terracotta tiles into precise, computer-guided geometric forms. These tiles still retain the natural beauty of the iron-laced clay colors, but they are more consistent in shape and dimension making it easier to install them. This also produces a more consistent look in the final installation. The art of making fired clay terracotta tiles by hand is one that is indigenous to several particular regions, including Mexico and parts of Europe. This process is an imprecise method, that produces pieces that have unique, hand-touched personality which matches great with the clay cast beauty of the tiles themselves. The drawback to handmade terracotta tile flooring is that it can be quite expensive, as the process of doing the work by hand takes far longer than when a machine mass produces them. The results can also be a little erratic, and dimensional qualities may make it difficult to get them to sit straight in a mortar bed. 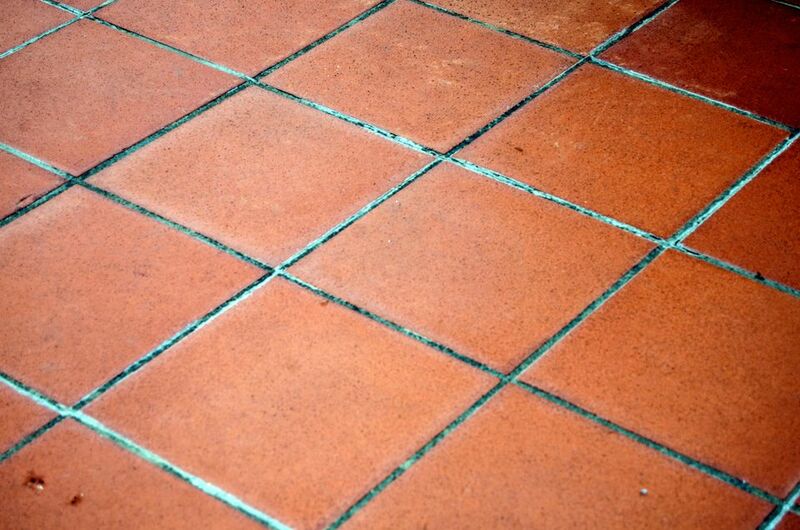 Terracotta tends to have an old world charm, that can be swept across a room when it is used as flooring. The material has a rough, rustic feel to it, that is both rugged and subdued all at once. This can be increased, or decreased, by purchasing handmade or machine cut pieces. Terracotta tiles can be used in some limited outdoor applications, but only in climates which do not get regular freezing temperatures. In colder climates, water could absorb into the stone, and then if it got cold, that water could freeze, expanding and cracking the tile.